At the international motorcycle fair INTERMOT in Cologne, Germany, on 3rd October FEMA invites you to join the European Motorcyclists Forum 2012. International researchers, experts and decision makers are going to present their views and results on motorcycle safety with a dedicated focus on training, licensing and road infrastructure. 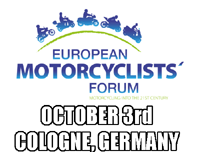 The European Motorcyclists Forum is a joint effort by the European Commission and the Federation of European Motorcyclists Associations (FEMA). This year it will be held at INTERMOT, next to EICMA the most important motorcycle fair worlwide, right after the prestigious IfZ Conference which is taking place on 1st and 2nd October. The 2nd edition of the European Motorcyclists Forum will host SIM2CO, a project dedicated to the development of simulated motorcycle training modules and RIDERSCAN, the project on motorcycle safety Europe co-funded by the European Commission. Liz de Rome, a senior researcher from Australia will report about their findings on motorcycle safety as well as Claes Tingvall, the road safety director of the Swedish transport authority. The afternoon program of the event will be split into two panel discussions. Taking into account the controversies that arose with the implementation of the 3rd Driving Licence Directive the first panel discussion will address the question “How does licensing relate to training and reversely - Towards a 4th driving licence directive improving motorcycle training and licensing”? Among other experts Gilles Bergot, Deputy Head of the Road Safety Unit of the European Commission will form part of the panel. The second discussion session will focus on “Improving infrastructure for motorcyclists – the need to review construction standards”. Next to other important topics, like the design and maintenance of roads and road surfaces the issue of motorcycle protection systems (guardrails and road restraint barriers) and the European standardization process will be addressed in detail. Participants of the European Motorcyclists forum are invited to visit the INTERMOT fair after the closure of the event.